368 pages | 79 B/W Illus. Engineers often find themselves tasked with the difficult challenge of developing a design that is both technically and economically feasible. 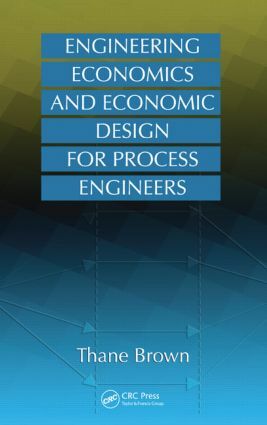 A sharply focused, how-to book, Engineering Economics and Economic Design for Process Engineers provides the tools and methods to resolve design and economic issues. It helps you integrate technical and economic decision making, creating more profit and growth for your organization. The book puts methods that are simple, fast, and inexpensive within easy reach. Author Thane Brown sets the stage by explaining the engineer’s role in the creation of economically feasible projects. He discusses the basic economics of projects — how they are funded, what kinds of investments they require, how revenues, expenses, profits, and risks are interrelated, and how cash flows into and out of a company. In the engineering economics section of the book, Brown covers topics such as present and future values, annuities, interest rates, inflation, and inflation indices. He details how to create order-of-magnitude and study grade estimates for the investments in a project and how to make study grade production cost estimates. Against this backdrop, Brown explores a unique scheme for producing an Economic Design. He demonstrates how using the Economic Design Model brings increased economic thinking and rigor into the early parts of design, the time in a project’s life when its cost structure is being set and when the engineer’s impact on profit is greatest. The model emphasizes three powerful new tools that help you create a comprehensive design option list. When the model is used early in a project, it can drastically lower both capital and production costs. The book’s uniquely industrial focus presents topics as they would happen in a real work situation. It shows you how to combine technical and economic decision making to create economically optimum designs and increase your impact on profit and growth, and, therefore, your importance to your organization. Using these time-tested techniques, you can design processes that cost less to build and operate, and improve your company’s profit. What Do Good Objectives Look Like? Creating Options: Flow Sheet Development.